For today, a simple, yet seemingly impossible puzzle. That is, they run into a problem that seems impossible to solve, but when the answer is revealed, the solution is seen to be trivial. These kinds of things drive students crazy. "It's impossible!" they cry. But when they finally figure it out (or the teacher shows them how), they realize how they were working waaay too hard and the answer was right in front of them the whole time. What short 4-word idiomatic phrase (in English) captures this idea of a problem that seems impossible, but actually has a simple and obvious solution? Be sure to say how you figured it out! 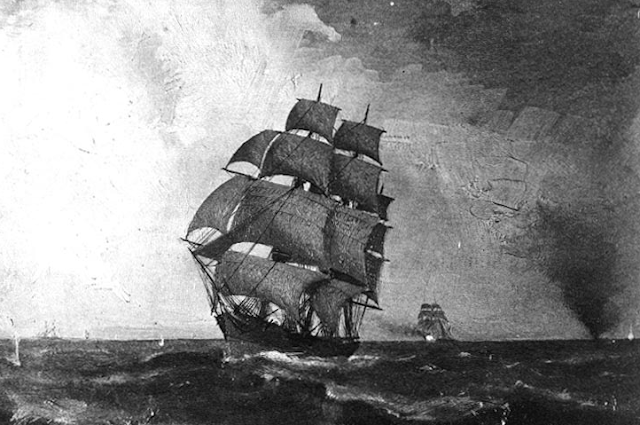 Quick answer: Jefferson did NOT think the Jane was a pirate ship… but it was a pretty close call in a time when merchant ships could act as privateers, and switch back to being regular trading vessels, and essentially all ships were armed to the teeth. To find the answer to this question, I started by first looking for the entire collected works of Thomas Jefferson. I figured that the answer would be somewhere in his collected writings, and I had suspicion that I could probably find every instance of the word “Jane” and jump right to the answer. The trick with such collections is to very carefully check to make sure it’s the COMPLETE collection (and not just the “Founding Documents” collection, or just his letters, or similar subset). ALSO, be careful that the collection isn’t larded up with lots of notes and commentaries, especially at the beginning of each chapter when a learned scholar writes his analysis of what lies in the chapter to come… these aren’t useful for our primary document research and can seriously mislead you if you're not careful in your search. My initial strategy was to find a collection, then use site: to search within the collection. But, alas, of the collections I found, all of them have broken up the documents into non-SITE:-searchable groups. The Scribd collection, for instance, has all 12 volumes of his collected words, but each volume is in a different subdirectory, and there isn’t a common root that I could use site: over! So I kept looking for such a site: searchable collection and after a few clicks found www.history1700s.com/etext/html/texts/jefferson/ as exactly what I was looking for. A quick site: search and… I found 2 hits. Huh? THAT didn’t make any sense. I know that there must be more hits than that (after all, Jefferson’s mother, sister and baby daughter were all named “Jane”). So I kept looking for a better resource. In a separate tab I pursued another strategy—to see if I could find some document written by Jefferson in 1793 about the Jane as a ship. So I used my old friend the AROUND operator like this to find the word "ship" within 3 words of the word "Jane" -- that removed any spurious hits. This in turn led me to a number of books that collected the writings of Jefferson. The first hit was “A message of the President of the United States to Congress relative to France and Great-Britain: delivered December 5, 1793, with the papers therein referred, to which are added the French originals.” This is a scanned book published in 1793 (so I think it’s a pretty reputable source). 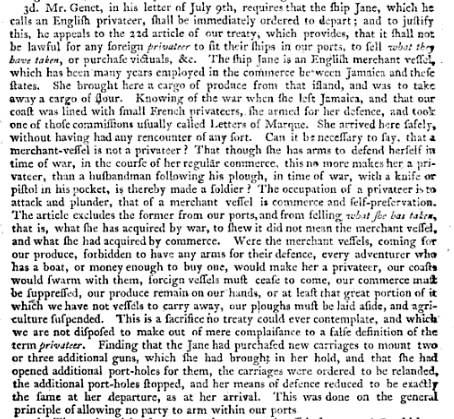 Reading the text (see below) it became clear that Mr. Genet was accusing the Jane of being an English privateer. The Jane has a letter of marquee (which would allow her to attack foreign vessels). And why else would she install 2 new cannons with carriages onboard? Jefferson, though, argues that this is just ordinary precautions that any vessel would take in time of war and strife. This was all a tricky political question because of the neutrality of the US wrt the war in France. 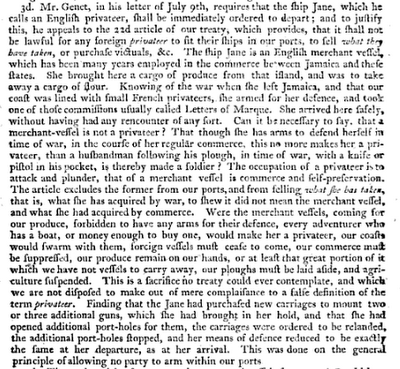 “Mr Genet in his letter of July 9th requires that the ship Jane which he calls an English privateer shall he immediately ordered to depart and to justify this he appeals to the 23d article of our treaty which provides that it shall not be lawful for any foreign privateer to sit their ships ill our ports to sell what they have taken or purchase victuals &c The ship Jane is an English merchant vessel which has been many years employed in the commerce between Jamaica and these states She brought here a cargo of produce from that island and was to take away a cargo of flour Knowing of the war when he left Jamaica and that our coast was lined with small French privateers she armed for her defence and took one of those commissions usually called Letters of Marque. She arrived here safely without having had any encounter of any sort. Can it be necessary to say that a merchant vessel is not a privateer That though she has arms to defend herself in time of war in the course of her regular commerce this no more makes her a privateer than a husbandman following his plough in time of war with a knife or pistol in his pocket is thereby made a soldier. The occupation of a privateer is to attack and plunder that of a merchant vessel is commerce and self preservation The article excludes the former from our ports and from selling what she has acquired by war to shew it did not mean the merchant vessel and what she had acquired by commerce. Were the merchant vessels coming for our produce forbidden to have any arms for their defence every adventurer who has a boat or money enough to buy one would make her a privateer our coasts would swarm with them foreign vessels must cease to come our commerce must be suppressed our produce remain on our hands or at least that great portion of it which we have not vessels to carry away our ploughs must he laid aside and agriculture suspended. This is a sacrifice no treaty could ever contemplate and which we are not disposed to make out of mere complaisance to a false definition of the term privateer Finding that the Jane had purchased new carriages to mount two or three additional guns which he had brought in her hold and that she opened additional port holes for them the carriages were ordered to be relanded the additional port holes stopped and her means of defence reduced to be the same at her departure as at her arrival This was done on the principle of allowing no party to arm within our ports." By the way, notice the variant spellings (“shew” and “defence”). Writing at this time had lots of interesting variations. Be sure to plan to search for those alternates as well! 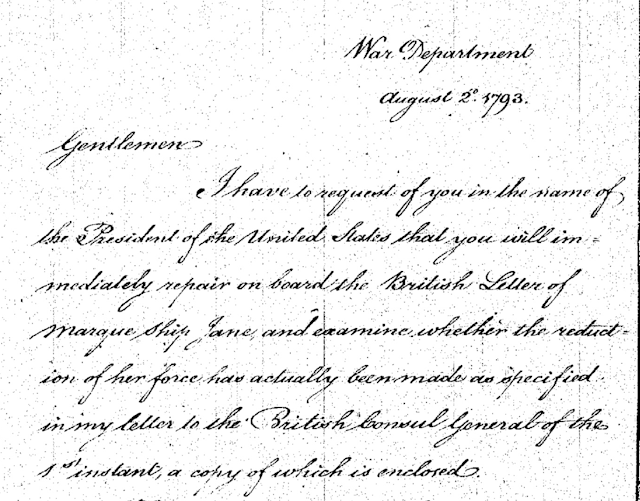 Finally, scanning through these texts, it’s a simple thing to find the letter of November 13, 1793, where Jefferson asserts that the Jane should be restored to her owners. It took a few months, but the Jane was found to NOT be a pirate, despite all of the armaments. Search lessons: In this case I pursued two strategies in parallel. My search for an easily searchable full-text of Jefferson’s writings didn’t quite work out the way I’d hoped. But my more general search DID work, and I was able to find what I needed in Google Books… from the original 1793 printing. Another key point to remember is that even relatively simple questions (“Was the Jane a pirate or not?”) often have richer, more complex answers than you might think. Jefferson’s choice was not just a simple yes/no determination of what the Jane’s intent was, but was played against a backdrop of a complex political situation that heavily influenced what judgments might be. Sometimes you just have to read a bit more than you’d think, just to understand what’s going on. But that’s real research. And I find this kind of searching to be completely fascinating. Wednesday Search Challenge (Feb 22, 2012): Did Jefferson think she was, or wasn't? In the sultry summer of 1793, Thomas Jefferson was the Secretary of State in the young United States. That's when the good ship Jane came into the harbor and an important question had to be resolved: Was she a pirate or not? France was in the midst of the French Revolutionary Wars, and the US had decided to remain technically neutral. But both France and Britain were interfering with shipping up and down the coast and into the Caribbean. This was, after all, the heyday of pirates, grog and sailors being impressed into service. In order to remain neutral, Jefferson had an important decision to make. Was the Jane merely a commercial vessel, or a pirate? Unlike the movies, wasn't always obvious which ship was which. Can you find what Jefferson had to say about this? What was his decision? Pirate or not? As usual, be sure to leave your comment with a description of how long it took you to find it, and HOW you found your answer. A small post today... Just two tips that I've found handy that I know many people don't know about. How to remove formatting when copy/pasting. There are many ways to do this, but the simplest way I know is to paste into a Chrome text field (e.g., in a Google Doc) by using CONTROL+SHIFT+V -- this will remove whatever RTF or HTML formatting that might be clinging to your copied text and paste just the plain-text. Very handy. You can now get emails of SearchReSearch in your mail. Yeah, I finally added the "Follow by email" gadget to the layout. It's in the upper right corner. You can put your email address there, and whenever I push out a post, you'll get it in your mail. Woot! Quick answer: It’s a “mouth bow” and it’s from… well… all over. There IS no distinct country of origin! Of the people who wrote in with answers, the average time to solve this particular problem was 5.9 minutes with a median of 5 minutes. Of course, we don’t know how long the people who never solved the challenge took! Presumably, they didn’t leave a comment. That’s an excellent start to a search when you don’t have any idea what the target is—just describe it as simply and plainly as possible, and let the internet do the heavy lifting for you. Searchers who started with a simple search found what they wanted fast. Search lesson: Start simple, especially when searching for something that you know nothing about! Origins: Once you start down this path of trying to figure out where it comes from, you quickly find that mouth bows seem to come from everywhere. 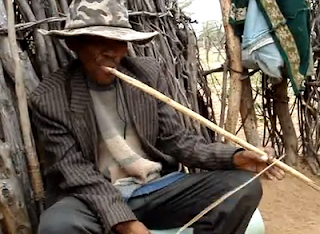 The Tsonga - Shangaan people called these Umqamgala (aka, “musical flute bow”) found in Southern Africa among the Tsonga or Zulu. 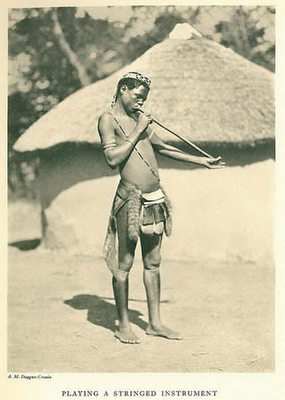 This picture is from the Ezakwantu gallery of historic African instruments. The Ndono (Tanzania) have their own version (audio file), and Chipendani can be found in Zimbabwe. I can go on. Once you start digging, you can find these things throughout all of Africa. 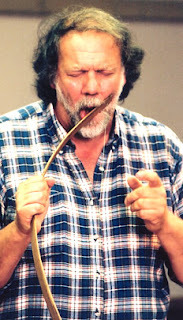 A similar instrument, the berimbau, is found in Brazil. Although it’s somewhat different (with a gourd resonator that can be used to produce different effects), it too seems to have come out of Africa. In Polynesia, the pakuru is the same instrument, although probably invented independently. 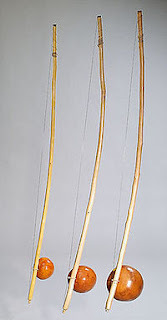 Since the instrument is as simple as having a bow with a string, it's likely that the mouth bow was invented multiple places in multiple times. It's said that there are cave paintings in France that depict mouth bows in use from ~13,000 BCE (but I wasn't able to find independent confirmation of this--if anyone can find a definitive photograph of this, I'd appreciate hearing about it). Search lesson: Be sure to double-check your findings, particularly about things (like point of mouth-bow origin) that could potentially have multiple interpretations. While many of the comments are correct about where the mouth-bow can be found, very few people pointed out that they seem to come from everywhere. In general, for results like this you want to try and disconfirm what you've found. Sometimes you'll stumble into entirely new categories of insights when you do! A couple of nice examples of mouth-bows--the first is an umqangala from Africa, the second is an American Appalachian mouth-bow. footnote: Worth noting that all of these instruments are variations on a common theme—a string held under tension, then plucked or hit with a stick, and using the mouth as a resonator. It’s very similar to a Jew’s harp (aka jaw harp, aka mouth harp), but those instruments usually have a metal frame holding a metal tang (rather than a string or wire) that’s struck. I love hearing instruments from around the world. But here's one instrument I found, and I don't know where it's from. What's the true name of this clever device? What is this instrument called? And what is the country of origin? 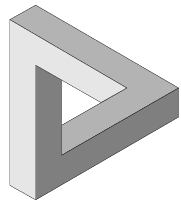 Don't forget to tell us how long it took you to figure it out and HOW you found what this is! I've written about scoping before, but it's worth revisiting with a little amplification. Scoping just means limiting the space of things you're searching over. A great example of this is the way a search on Maps.Google.com limits the search to the part of the map that's visible. 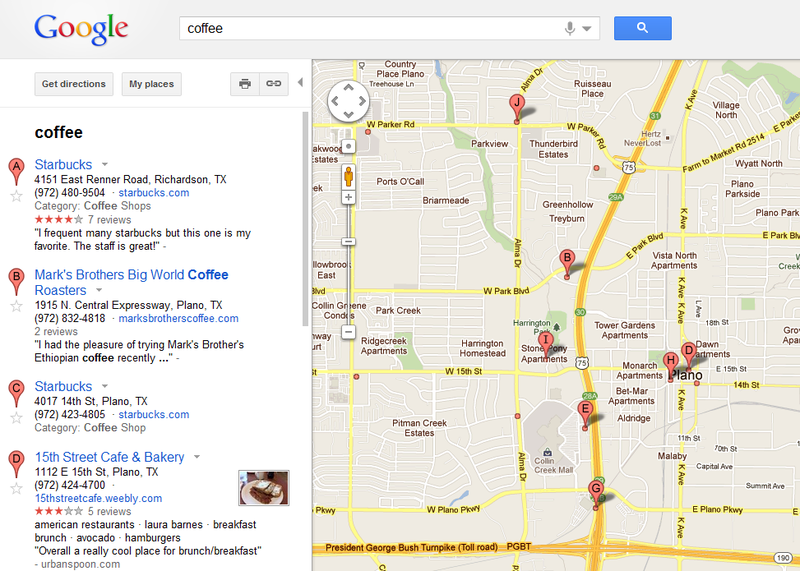 When I do a search for [ coffee ], my search is limited to the boundaries of the map--that is, it's scoped to the visible map and not all of the shops in the Google index. The great thing about this kind of scoping is that you can see the effects of changing the scope! If you zoom in, the results in the periphery go away. If you drag the map side-to-side, the results will change depending on what's in the scope. In essence, all scoping is like this. You start a search with the scope of the index you're searching. For instance, you could scope your search to the contents of JSTOR, if you're searching their index. Or you could scope your search by using an operator like filetype: or site: Big point: You're not going to find things that are out-of-scope. You can see what's happening at each step... you're focusing the search onto a smaller and smaller piece of the index. 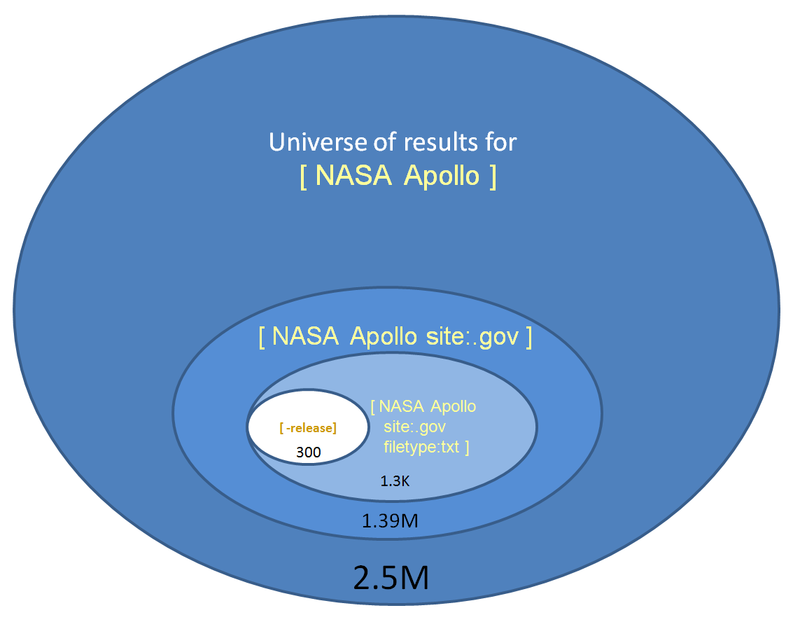 The first query has around 2.5M results; the second query reduces that to 1.39M, etc. But suppose the thing you're looking at isn't at NASA.gov at all? What it were on the NYTimes.com site? Then you'd be overly scoped and stuck searching in a part of the index that has no chance of containing your desired search target. (2) Focus your search: Typically, scoping reduces the number of possible hits given your query. You might start with millions of hits, and if you go down to the right scope, then you can do a query that would be meaningless in the wild and wooly larger scope, but very meaningful in the smaller scope. In an earlier post (SearchResearch of Oct 13, 2010) I pointed out how limiting your search to the scope of an encyclopedic book can give you wonderful power. In that example I showed how using Book search to search within the text of David Kahn's "Codebreakers" allows you to search for the single word "cliche" and find the answer. Obviously, if your search isn't scoped to just the contents of that book, then a single-word query like that wouldn't work very well. Ways to scope: I've given you a few of the ways I do scoping. B. Use advanced operators when you can. My most-used operator is probably site: followed closely by filetype: -- both of these scope your search tightly. (But be aware, if you can't find it within the scope, consider stepping back a few scopes and rethinking your strategy.) Remember that the - (minus) operator also acts to scope your search by removing some of the hits. C. Books can be a scope too. On more than a few occasions I've found something by doing a full-text search inside of a book text. 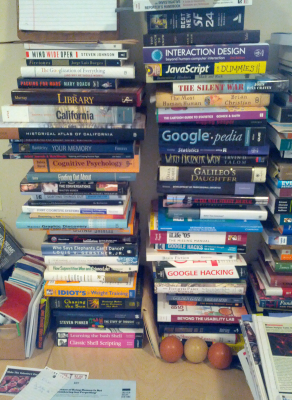 Remember that Google Books has a ton of books, as does Amazon (usually more recent book texts). There are other repositories worth remembering as well. More tactics and strategies to come, but this will get you started on scoping! Quick answer: You need a "tap and die" set--you'll use the tap to add threads to the new hole, and you use the die to put threads onto a bolt. Your best bet to find a tap and die set is at Sutliff True Value hardware store, 10 miles away across the water on Kodiak Island. How did I figure this one out? Determining what tools you need: It's pretty clear from my description of the problem that you need to re-make the threads in the hole and the damaged bolt. If you were lucky enough to grow up knowing what a "tap and die" are, then you're halfway done. Most of us didn't learn about metalworking at our uncle's knee... so we have to look this up. Luckily, it's not hard: A query like [ tool to make threads ] quickly leads you to a number of articles, most of which talk about "tap and die." It won't take long for you to figure out that a tap is a thing you screw into a hole (like the one on the back of your truck) to make the threads. So now you know you need to get a "tap and die set." Unfortunately, the query [ tap and die set Ouzinkie ] isn't very productive. 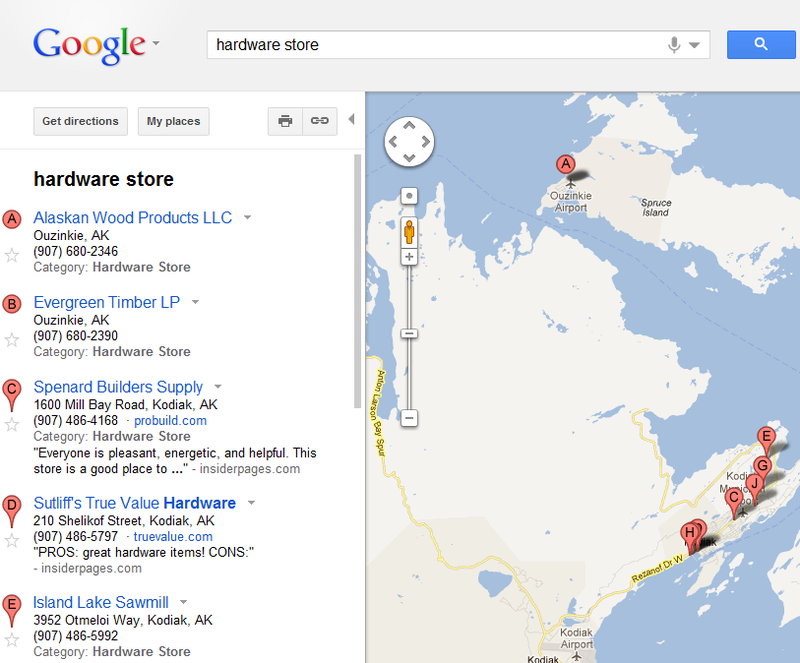 It's a very small town; not large enough to have its own hardware store with a lot of specialized metalworking tools. Generally, if you zoom Maps to a reasonable view and do a query in Maps, you'll be able to find whatever product or services that exist within that view. In other words, the view in the Map will limit your search to that region shown. But Ouzinkie is pretty remote, and the obvious search for [ tool and die set ] on the map gives you... nothing. When you're stuck like this, you have to shift strategies. Earlier we talked about how sometimes an effective strategy is to look for something more specific. That is, look for a specialization of the thing you seek. Problem is, "tool and die" is already pretty specific. If a search for "tool and die" didn't show anything, it's unlikely that something more specific will work either. So let's try the opposite and search for something more general. What's more general than "tool and die"? You could look for "metalworking tools" or "threading tools," but since we want to buy (or borrow them), it might make sense to look for something that HOLDS a tool and die set... and that would be either a hardware store or a welding supplies shop. Several readers pointed out that a mechanic at the airport might have a tool/die set, and that's true. In small towns, it's a good chance that you could just borrow it from an local mechanic, and that the best search strategy might be to go there and ask around. True. Don't underestimate the value of local knowledge in a case like this! 1. 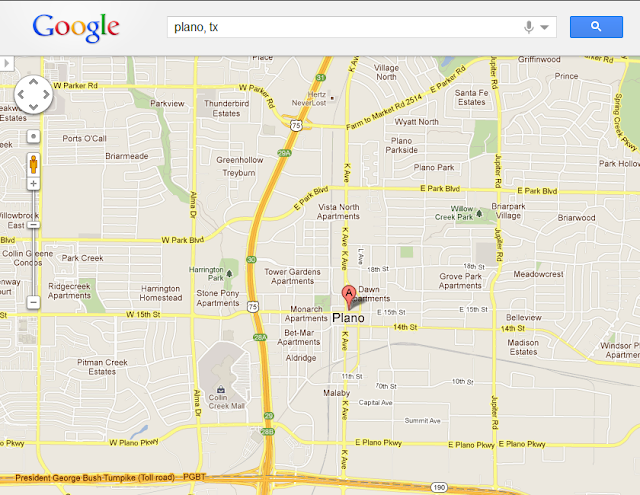 Map search is great for searches in an area. It would be crazy-making to try and find all of the stores or businesses of a given type--but Maps search makes that easy. 2. Sometimes you need to expand your search to the super-category. 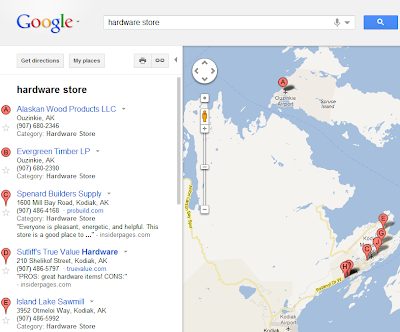 Here, we rewrote our search for [hardware store] as a place to find "tool and die set." That's often a great strategy to employ--think about what would be a larger or more abstract description of the thing you seek... or, as in this case, a description of the place where your real search target might be found. Better get on the ferry. I heard it's supposed to snow tonight. Wednesday Search challenge (Feb 8, 2012): Where can I find that tool? While driving down the main drag of Ouzinkie towing your fishing boat to the harbor you hear an ominous clank. You stop and walk to the back of your truck to check out the damage. 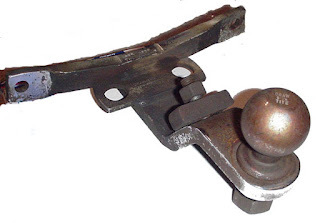 Much to your dismay you find that the main bolt holding the trailer hitch onto your truck has pulled out of the mounting flange. What’s worse, when it pulled out, it destroyed the threads on the bolt hole. Because of the way your hitch is built, there’s only one good way to repair it—and that’s to drill a new mounting hole on the flange, remake the threading in the hole AND restore the threads on the bolt. There really isn't any other option. You’ll need at least two different tools to solve this problem—one to remake the threads on the bolt, and another to cut the threads in the hole. (2) Where’s the closest place for you to get the tools you need (assuming you're broken down on the main street in Ouzinkie)? Comment: I'm not sure how you'll solve it, but I had to use an interesting search technique to do this challenge. I'll be really interested to see what you do! Be sure to tell us the search path you followed, and how long it takes you to figure it out. Also, let us know if you already know what devices you'll need to fix the hitch! Technically, to be literate means you can simply read and write (that is, code and decode) in the representation system of your social group. But even that simple definition assumes that there is a shared coding scheme. If you’re a kid in the US in the early 21st century, that’s probably English; but it could also just as well be Spanish or Chinese. But it also has the sense of having knowledge or being competent in a specific area. You can say, “he’s literate about wine,” “literate about netsuke,” or “literate about the Old Testament.” A quick search reveals a whole host of literacies that are common these days: media literacy, information literacy, financial, bible, multicultural, interactive, news, environmental... on and on. So let me ask you again: Are you literate…. in all of these different *kinds* of literacies? Which do you choose to be literate in? Let’s see: Which of these can you read & write? How about topic literacy? Can you name the top wine producers in the Los Carneros region? The three main kinds of netsuke? The mother of Ishmael? Probably not. But all this is not to prove that you’re illiterate, but just to make the point that we’re all illiterate with respect to a culture, a body of knowledge, or a technology we don’t understand. To put it conversely, we’re only literate over a smallish amount of information. There’s a lot out there, though, and it seems to me there’s actually a new kind of literacy that we need to understand. As I mentioned last week, even if you know how to research something, you still need to know a little bit about the structure of how to search. Searching for the answers to the questions above isn't that hard... but it requires that you know how to search. And this is that new kind of literacy I was talking about—knowing how-to-search and knowing-what-to-search. These days, with the flood of information we live with, it’s not enough just to be able to read and write whatever might fall into your hands. Reading—really reading with insight and understanding—requires the ability to read-in-depth, and that means looking stuff up. Writing—again, really writing with care and insight, means looking up more stuff or verifying that what you’re writing is accurate. People who are good at search and retrieval not only save time, but are far more likely to find (and create) higher quality, more credible, more useful content. More importantly, they can ask questions that were impossible just a few years ago. The biggest shift in the past few years has been the transformation of questions that were difficult to answer, but are essentially quick lookups. We have changed the impossible question into the instant answer—but only if you know how. In a sense, that’s my mission—to help people become better searchers, beyond just the basic skill of knowing how to make Google dance. My goal is to help people understand the larger issues at play here—how to be a literate person now, and now to be continually learning how to be literate as changes happen in the future. This is the idea of *metaliteracy*—knowing how to be literate about your own literacy. Why should you care about meta-literacy? Here’s a thing worth knowing. The rate of introduction of new media, new genres, and new technology for reading & writing is pretty high now, and is continually increasing. Think about it for a second: How many of the media technologies that you use on a daily basis weren’t around 10 years ago? YouTube, Google News, FaceBook, Google+, podcasting, screencasting, IM, iPads… these all really date to around 2004-2006. But more are coming all the time. Every week sees the introduction of some new kind of thing to read. More importantly, how many of the methods you use to read/write in these media existed a decade ago? It’s now commonplace for a “swipe” gesture to do something on your phone or tablet. Gestures have been around for decades in the research literature, but now it’s a interaction method that most *literate* people understand—it’s how you get to the next page. Literacy transcends just text. Of course, it has for quite a while—we just tend to not talk about figures and diagrams that have always been part of the document. Literacy transcends just medium. The skills for reading newspapers are somewhat different than those needed for books, especially as books continue to evolve. And this will be true for new media going forward. Do you really know how to read and write social media? Another example: With an elegant first publication, PushPopPress just launched (as opposed to “published”) a new “full-length feature” digital book, “Our Choice.” http://pushpoppress.com/ourchoice/ It’s a wonderfully genre-bending thing that has interactive graphics, embedded videos, and text that weaves through and with all the media. “Reading” this kind of text is very different than traditional reading—you turn the “page” with a swipe gesture, but go “into subsections” with a pinch-expand gesture. What was once a footnote is now an animation of how geothermal works, or an interactive visualization of wind energy resources. Audio isn’t just layered on, it’s integral to the work. So.. What do you really need to know to be literate? You need to understand at least that the technology—that is, the medium—is substantially different. “Our Choice,” like other web-based software, can be modified each time you launch it. I don’t know if they’ll do that or not, but it’s very possible, just as Amazon wiped-out copies of “1984” from Kindle owners who had purchased the text. When a question of whether or not the seller actually had copyright, Amazon just removed the app… um… the *text*… from the device. Of course, it’s deeply ironic that it was “1984.” And of course, the ways in which you read such a text is very different than the way you read the original “1984.” Imagine a PushPopPress edition of “1984,” with links to all of the glosses, the movies, the interviews, the radio broadcasts, and learned commentary. It’s not just text anymore, and it’s not a fixed corpus, and it’s not just a page-turner. You need to change your understanding of documents and what it means to read one. Metaliteracy means that you know how to organize your own learning around literacy. This will be vitally important as media kinds flourish, change, and pass away. While being literate is something we take for granted, knowing how to drive your own literacy learning and understanding of what it means to BE literate will be essential. If you don’t pay attention to your literacy, it would be easy for you to miss important elements of reading and writing in the new media. Do you agree? What do YOU think it means to be literate now? Synecdoche: a term referring to a part of something to stand in for the whole thing. It's a slightly scary word that you might remember from your linguistics class. It's when you refer to a part of something in place of the whole thing--say, "I need a ranch hand down here to round up these cattle." In this sentence, the word hand refers to a person (a cowboy) by using just a part of a whole person. What's this got to do with search strategies? Simple. Sometimes it's a great idea to NOT try and find the whole thing that you can't recall, but to find a "piece of the whole thing" because it's simpler to find, or it's more popular, or you can't figure out what the whole thing is called. 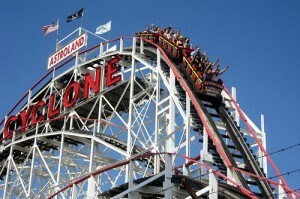 The query [ roller coaster Cyclone ] quickly shows you that it's in Coney Island. Great! That actually was the name of the roller coaster. Now, where's Coney Island? Another query for [ Coney Island borough ] and you'll find out that it's in Brooklyn, and you're set. This is the funny thing about human memory--it often can surface small details that would seem insignificant, but can be useful clues when searching. As a search strategy, synecdoche is done whenever you can remember a part of the whole. You then work upwards (towards higher levels of abstraction) from that piece. Real Example: A friend wanted to know "what's the name of that cloud-services company in the UK that's got something to do with the ring of little petals at the back of the flower?" I know, I know... I get a lot of really strange search requests. But this one is a great example of synecdoche in action. I already knew that "little petals at the back of the flower" were called "sepals." Okay. How can we work with this? I changed this question into "What's the name of the structure made up of sepals at the back of the flower?" A quick search on [ sepals structure ] tells me that this is called a "calyx." Using this as my new search term, a quick [ calyx cloud ] search takes me right to the web site that's desired. 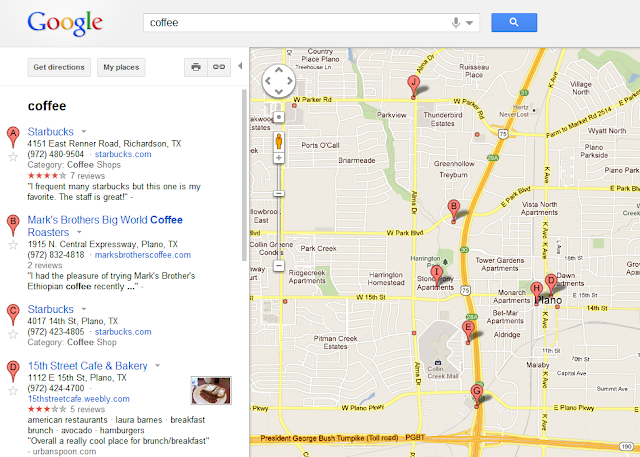 It's a nice example of using synecdoche as a search strategy to get to where you want to go. Search on... upwards on the abstraction hierarchy! Fast answer: Our amnesiac friend is in the Google offices in the Warsaw Financial Center at Emilii Plater 53, Warsaw, Poland. The phone number is +48 22 207 19 00 and this photo is taken from the 10th floor. That’s a remarkable amount of information from just one picture. How do you do it? In a case like this, you have to start with what you have. Look at the image (click on it to get the high-res version of the image). There are only a few things to really start with. Two buildings have logos that might be useful, and there’s a flag in the lower left corner. A quick check of the flags-of-the-world shows that this is an Egyptian flag, but surely isn’t Cairo or anywhere else in Egypt, so that’s just a false lead. You can also figure this out by doing an Image search for [ tp ] – yeah, it seems unlikely, but the TP logo shows up on the first page of Image results, and that leads you to the Telekomunikacja Polska website. 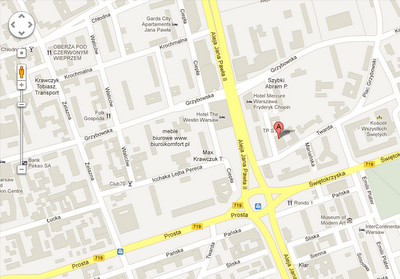 Knowing this, I could easily get the street address for the TP building: 14/16 Twarda Street, Warsaw. Now, how to find where the photo was taken FROM? I tried doing this with Google Maps, but I couldn’t quite get the angle I wanted to verify where the photo was taken from. 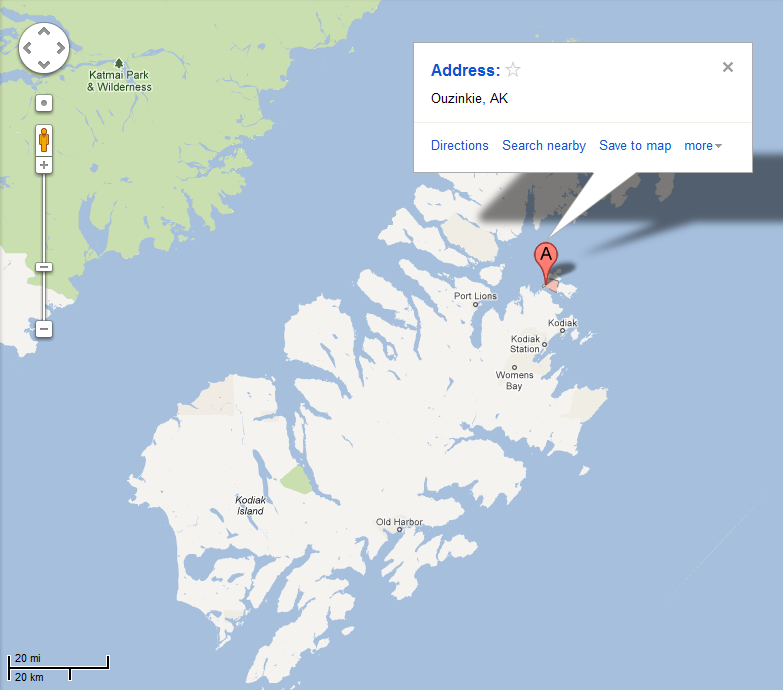 That’s when I realized this was really a Google Earth problem. Searching in Google Earth for the TP building at 14/16 Twarda Street, I was able to get to exactly the same view I see in Maps, but if you turn on the 3D buildings layer, you get a very different perspective. I then just flew around in Google Earth until I pretty much matched the view. Once I had the view matched with the photograph (which I did by lining up the buildings), I literally “turned around” in Earth to see the building, double-clicked on the building, and up pops the information: Warsaw Financial Center. Now… how to figure out what office/floor you’re on? You can estimate it by looking at the altitude of the view, something that Google Earth tells you in the lower right corner. From that number (120 meters), we can guess we're somewhere around the 15th floor or so. But to get the exact floor? Ah... THIS takes a little detective work! 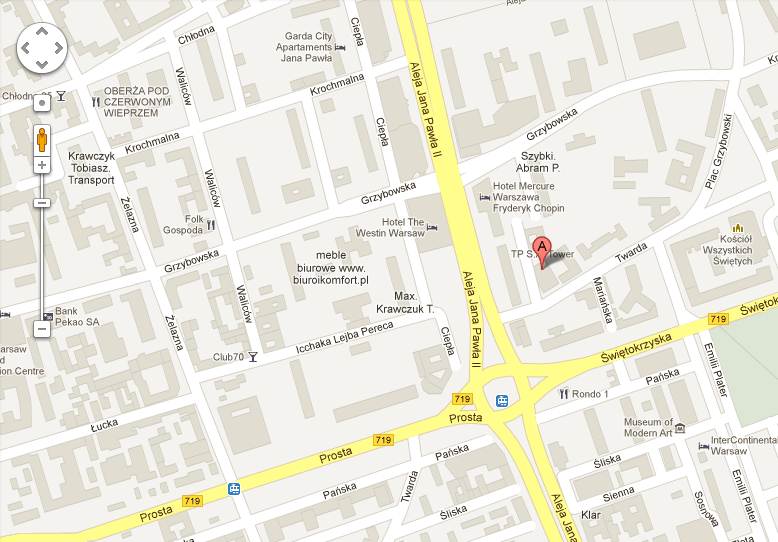 From there, it’s not hard to find the Google offices in the Warsaw Financial Center, which tell us the exact floor (10th) and phone number. And once you have THAT information, it's pretty straightforward to figure out that the Google offices are on the 10th floor. (1) Sometimes clues can be misleading (the Egyptian flag). It's important to NOT get bogged down in dead ends, but be willing to change your strategy on the fly. (2) Google's Search By Image, while a great tool, will have difficulty on a cityscape like this unless it happens to be a well-known view (such as the view of Paris from standard photo spots). So you probably have to use Maps or, as in this example, Google Earth. (3) Google Earth is a valuable search tool when you're looking for objects that you can't identify otherwise. In this case, we could align the photo with the 3D buildings and literally work backwards to identify the Warsaw Financial Tower. (4) Sometimes clues are hidden in the details. In the case of the Google logo appearing reflected in the glass, it becomes apparent once you isolate that part of the image, magnify it, and reflect it around the Y axis. That one clue then lets you figure out the exact location. Above all, you just have to think like a detective.